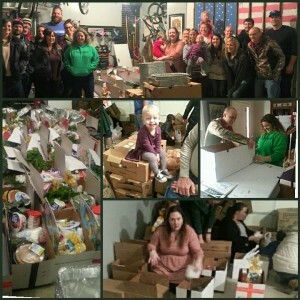 The Bloomington-Normal Jaycees work to fight hunger and bring some cheer to the Thanksgiving season. You can make a donation online below! The Thanksgiving Baskets project does this by provide everything a family a basket with all the necessities for a good, well-balanced, thanksgiving dinner- including the turkey, stuffing, mashed potatoes, cranberry, green bean casserole, bread, and pumpkin pie… and the pans needed to cook these items in. With the help of Family Video (who provide the turkeys), we average 40 baskets assembled and delivered to families in need. We select the families by reaching out to local food shelters and medical centers that service the needy. Assembly and distribution of baskets typically occurs the weekend before Thanksgiving.